Imperialism at home and abroad: Policy or system of exploitation? LeiLani Dowell, FIST leader at the forum in NYC, July 22. Larry Hales, Fight Imperialism, Stand Together (FIST) organizer, forum July 15 in NYC. Speaker: Larry Hales, a national leader of FIST, Dec. 11 in NYC. 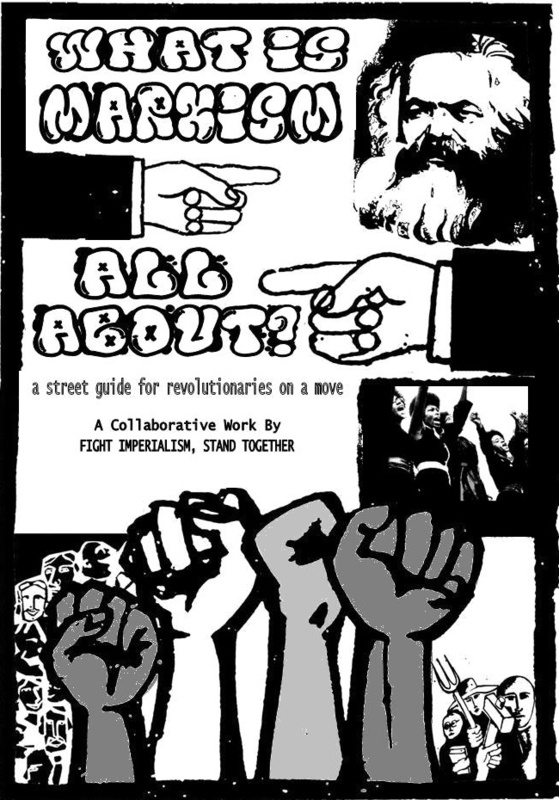 FIST class based on the new book “What is Marxism all about?” At the Marxist School of Theory and Struggle, Oct. 31. Larry Hales, breaks down Historical Materialism and how the state arose. David Hoskins reviews the core principles of Leninism and explains Lenin’s scientific definition of imperialism. Larry Hales, Fight Imperialism, Stand Together organizer, at the Workers World Forum, Oct. 23 in NYC. Larry Hales, national FIST organizer, contributing editor to Workers World newspaper, at the Workers World Forum, NYC, August 8, 2009. Larry Hales, a Workers World contributing editor, national FIST leader, at the Workers World Forum, NYC, May 15, 2009. David Hoskins, FIST organizer, contributing editor to Workers World, at the Workers World Forum, NYC, May 8, 2009. Julie Fry, a national leader of Fight Imperialism, Stand Together, at the Workers World Forum, NYC, April 24, 2009. Larry Hales, a Workers World contributing editor, national FIST leader, at the Workers World Forum, NYC, April 17, 2009. John Santos, Fight Imperialism, Stand Together activist at the Workers World Forum, NYC, April 17, 2009. LeiLani Dowell, a national leader of Fight Imperialism Stand Together and a managing editor of WW newspaper, at Workers World Forum, NYC, March 20, 2009. LeiLani Dowell, FIST organizer, at the Black History Month Forum, NYC, Feb. 27. Larry Hales, FIST organizer, at the Black History Month Forum, NYC, Feb. 27. Lila Goldstein of FIST, Hampshire College student, leader of divestment struggle. At Workers World Forum, NYC, Jan. 23. Palestine United and Raleigh FIST rally in Raleigh, NC against Israel massacre in Gaza. Larry Hales of FIST at the Workers World Forum, NYC, Dec. 12, 2008. The second video titled “Youth for Mumia” is from the conclusion of the protest march in front of the Federal Court at 6th and Market, where Mumia’s oral arguments took place on May 17, 2007. Featured are Pam Africa Larry Hales of Fight Imperialism—Stand Together (FIST)and Isolina from Iglesia San Romero de las Americas. LeiLani Dowell, a leader of Fight Imperialism, Stand Together and a Managing Editor of Workers World newspaper speaks at Workers World Party conference, Nov 15-16. 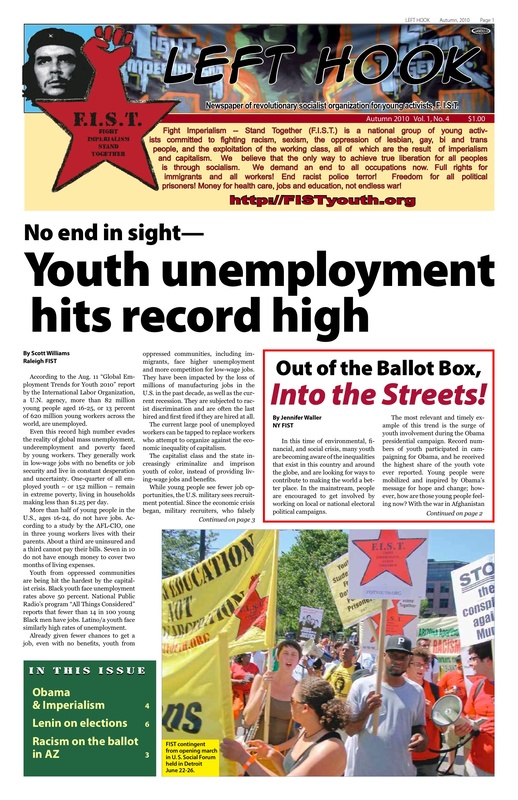 Larry Hales, a leader of Fight Imperialism, Stand Together and Contributing Editor to Workers World newspaper. Tyneisha Bowens, a leader of Fight Imperialism, Stand Together in Philadelphia and a member of Students for a Democratic Society. Excerpted from a talk given by Dante Strobino from Raleigh, NC FIST at the Workers World Party National Conference, Nov. 15-16. Excerpts from a talk given by David Hoskins from Washington, DC FIST at the Workers World Party National Conference, Nov. 15-16. Larry Hales co-founder of Recreate 68 in Denver and leader of FIST speaks on self-determiniation and the right to self defense along with other speaks at rally on Sunday, August 24, 2008. Larry Hales, national FIST organizer, speaking at the Workers World Forum, June 13, 2008, in NYC. Many members of FIST from Cleveland, Denver, NYC, Miami and Raleigh traveled to Washington DC to join the Ad Hoc national Network to Stop Foreclosures and Evictions in protesting the meeting of the Mortgage Bankers Association on April 16, 2008. Click here to watch video . LeiLani Dowell of FIST. At the Workers World & (FIST) forum in honor of the 100th anniversary of the International Working Women’s Month, March 28, 2008, NYC. Tyneisha Bowens of FIST. At the Workers World & (FIST) forum in honor of the 100th anniversary of the International Working Women’s Month, March 28, 2008, NYC. Socialism vs Capitalism debate at Baldwin Wallace College. FIST member, Caleb Maupin, debates campus libertarian. Click here to watch video. LeiLani Dowell, a leader of Fight Imperialism Stand Together youth group and a Managing Editor of Workers World newspaper, speaking at the Workers World Forum, Dec. 14, 2007, in NYC. Tyneisha Bowens of FIST gives an update on the struggle to free Mumia Abu-Jamal, including the Dec. 6 protest at the Today Show and the Dec. 8 Philadelphia demonstration. At a Workers World Forum, NYC, Dec. 7, 2007. Larry Hales, a leader of Fight Imperialism, Stand Together and a contributing editor of Workers World newspaper. At the Workers World Party National Conference, Nov. 18, 2007, in New York City. Miya Campbell, an organizer with FIST, Women’s Fightback Network and Workers World Party member in Boston, gives a second spoken word selection on day two of the Workers World Party National Conference, Nov. 18, 2007, in New York City. Miya Campbell, an organizer with FIST, Women’s Fightback Network and Workers World Party member in Boston, gives a spoken word selection. At the Workers World Party National Conference, Nov. 17, 2007, in New York City. LeiLani Dowell, a leader of Fight Imperialism Stand Together youth group and a Managing Editor of Workers World newspaper, at the Workers World Party National Conference, Nov. 17, 2007, in New York City. Tyneisha Bowens, a leader of Fight Imperialism, Stand Together, member of Students for a Democratic Society from North Carolina and WWP, At Workers World Party National Conference, Nov. 17, 2007, in New York City. Laura, chairing. Speakers: Dante Strobino, Caleb Maupin, Mike Martinez, Filipe, Tyneisha Bowens, and Miya Campbell. FIST members speak on the legacy of Che Guevara. 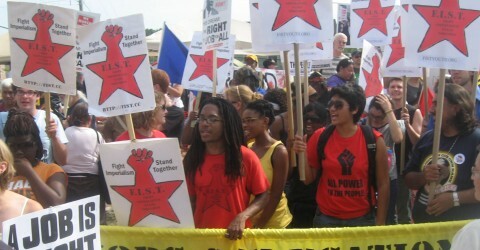 At the Workers World Party Conference, Nov. 17, 2007. LeiLani Dowell, a managing editor of Workers World newspaper and a leader of the FIST – Fight Imperialism, Stand Together – youth group, speaking at a Workers World Forum in NYC Oct. 26, 2007. Julie Fry, from the New York Free the Five Committee and Workers World Party, and a main organizer of a youth travel challenge to Cuba this past summer, speaking at a Workers World Forum in NYC Oct 26, 2007. On Oct. 9, 1967, U.S.-backed forces killed Ernesto “Che” Guevara. Many know Che as a pop icon, but he was much, much more. Che’s legacy is the struggle for world socialism. LeiLani Dowell speaks on that legacy. Workers World Forum, NYC, Oct. 12, 2007. I salute all from TARSUS CITY TURKEY….